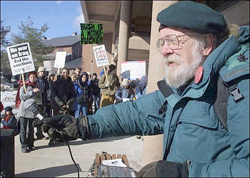 Will Miller at a UVM anti-war protest. The Will Miller Social Justice Lecture series will bring speakers to the UVM campus and the Burlington community to provide a continuing program of radical analyses of social, ecological and political concerns. 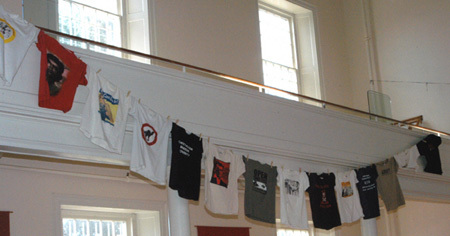 The series is dedicated to Will Miller, Vermont’s activist philosopher and UVM Philosophy Professor for 35 years. 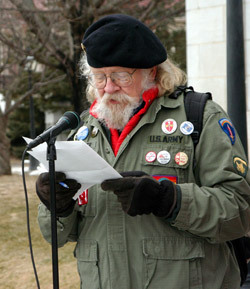 Will speaking Out against the war. Will set a courageous example in speaking truth to power. Despite how easy it might have been for him to become pessimistic, he showed boundless optimism and a passion for the truth. His voice was powerful, especially in encouraging other voices — those of students, staff, faculty, community members and people from around the world — to speak up and be heard. Always vigilant, he helped, with personal strength and an unwavering commitment to the struggle against war and for social justice, to move others into action. He was never afraid to speak his mind, put words into action or place himself “on-the-line” whether before the university trustees, on a picket line, at a barricade or in a congressional office when arrest was imminent. Will offered reasoned and insightful analyses into the origins and workings of capitalism and imperialism, giving us both a call to struggle and a vision of a more just society, a society where all work is valued; where truth is not silenced but nurtured; where all are treated as equals; that is at peace with itself; and in which neither people nor resources are exploited. The inspiration for our logo.